Abuja, 11 July 2018: South African President Cyril Ramaphosa today in Abuja addressed attendees at the Annual Meetings and 25th Anniversary Celebrations of the African Export-Import Bank (Afreximbank), telling them that the African Continental Free Trade Area (AfCFTA) would provide the integrated and diversified markets that will unlock Africa’s full productive capacity. 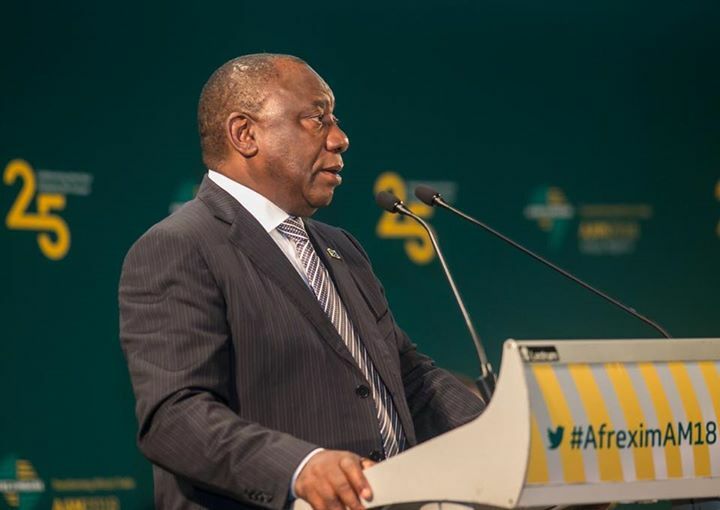 In a keynote address on the opening day of the Annual Meetings and Celebrations, President Ramaphosa said that the AfCFTA held enormous opportunities for the growth of the economies of the African continent. He highlighted the need to address the continent’s infrastructure deficit and to pursue industrial development. In his address, Dr. Benedict Oramah, President of Afreximbank, welcomed the signing of the AfCFTA agreement by 44 African nations in Kigali in March and said that it will accelerate the integration of Africa markets, foster regional value chains and promote dynamic competitive advantage across Africa for certain kinds of goods as well as boost employment. He further stated that it is important that the AfCFTA be thoroughly debated so that everyone can understand both the opportunities it offered and the obstacles that still needed to be overcome. Kemi Adeosun, Minister of Finance of Nigeria’s said that continued infrastructure improvements and a focus on trade, particularly regional trade, would drive sustainable growth. Ms. Adeosun commended Afreximbank for its role during the last global recession when it supported many African countries with trade support and lines of credit at a time when others were withdrawing from Africa. More than 100 speakers, including Heads of State, ministers, central bank governors, heads of of international organisations, business leaders, African and global trade development experts, and academics, are scheduled to speak during the four days of the Annual Meetings and 25th Anniversary celebrations.